It's our opinion that the SK650 will be quite a polarising keyboard, and we would definitely recommend that you try it first to make sure it's compatible with your typing style. The Cherry Low Profile switches are practically silent compared to the Razer Greens on our daily driver, and as stated, they would be well appreciated in a quiet office, and to this end, if you like to take your keyboard with you to work or indeed to LAN parties the SK650 would definitely be high on our list of recommendations. The size & weight alongside the included carry pouch lends itself to being taken on your travels. The carry case does it's job well in protecting the brushed aluminium top plate, even when in tightly packed spaces. This keyboard, in our opinion, is one of the best looking keyboards on the market, the vivid RGB really makes the brushed aluminium face plate really pop and even with the RGB disabled the keyboard looks sleek and very classy. The lack of dedicated macro & media keys is somewhat mitigated by the fact you can assign your macros to any unused key and that you have access to media keys through the Function button. Your key bindings can be saved to 1 of the 4 profile slots that are available but this only goes some way to combating the fact that you have to change your keyboard profile to have access to them when adding macro keys would have only added an extra inch or so to the length of the keyboard. We understand that Cooler Master were aiming to design a sleek, low-profile keyboard however the lack of a wrist wrest and adjustable feet is a deal breaker for us unfortunately, especially at this price point and we can't see that adding feet to the keyboard would add too much extra height. It's a shame that Cooler Master didn't make the decision to include these as it would replace our daily driver, if only they were included. With all this said if you're looking for a low-profile keyboard that doesn't sacrifice the feel and performance of mechanical switches, the Cooler Master SK650 would be high in our list of recommendations with the caveat that you try before you buy. 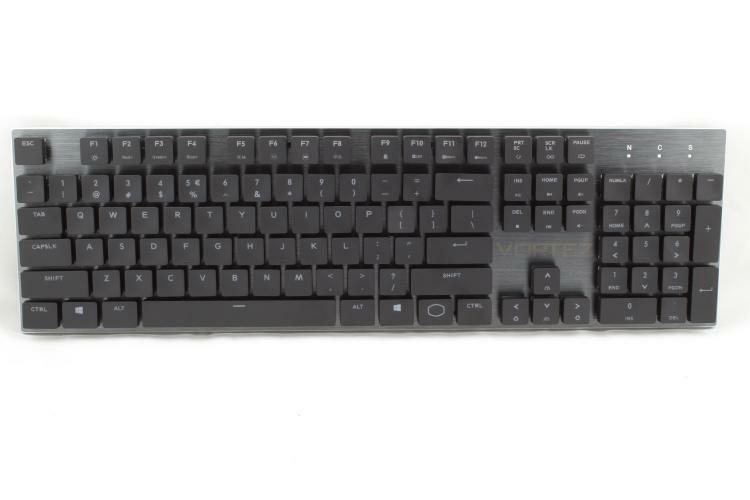 This keyboard looks great and would be at home on a minimalist work station, it's great to type on once you get used to the key spacing and work around the comfortability issues. We recommend trying it to make sure your typing style is compatible before you buy as if it isn't you will need to purchase a wrist rest.